So this is what it looks like this morning about 8 AM. We are told that we have 18-20 inches but it is blowing around so much that there are great big 5' drifts and other places where you can see the blades of grass. We are supposed to get around 6"more by the time it stops this evening. Sorry SJ - I wasn't fast enough to get a shot of the plow as it swooped around the cul de sac. 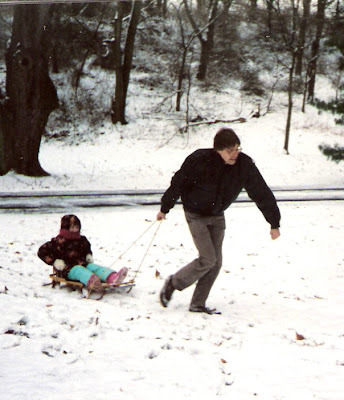 Woke up thinking of the winter of 91 (I think) when ABJ's Uncle took her sledding at Windy Hill.